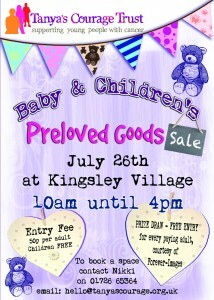 We are excited to say we are holding our first ever Baby and Children’s Preloved goods sale on Sunday July 26th. The event will be held in the Exhibition Hall (downstairs) at Kingsley Village (Fraddon), and we will have a vast array of stalls from people selling their preloved items of baby and childrens goods. Looking to grab a bargain? Have you got items to sell that you no longer need? Stalls are still available at £10 per pitch (6ft table supplied & two chairs) Contact our office on 01726 65364 with enquiries or to reserve your space. We will have a baby changing area as well as a feeding area.